In 1891 Harry Clifford Love leased property from Mrs Sidney Brodie Whatmore, who had obtained a rescission to acquire the crown land on the Lane Cove River. In 1894 he opened the Chicago Starch Mills and in 1907 and 1908 purchased the land. Initially the mill made cornflour and laundry starch. By 1911 Clifford Love and Company processed oatmeal and other commodities. In 1966 Corn Products Company bought the factory. Fielders bought a share of the company in 1977 and the remainder in 1986, trading as Goodman Fielder Mills Limited. In 2000 the company was sold to the Penford Corporation and now trades as Penford Australia Limited. In August, 2013 the Mill was being operated by Ingredion. The Chicago Starch Mills that opened on the banks of the Lane Cove River on the 3rd November, 1894 were used to manufacture starch and cornflour. It appears that the industry began in buildings previously erected by John Sugden Berry, a bone dust manufacture who had operated a boiling down works on the site of the future mill. Harry Clifford Love, first leased the property from Mrs Sidney Brodie Whatmore in July 1891 and purchased the land on which the mill stood in 1908.The mill had been built within the 100 foot reservation, land by law owned by the Crown. However, Mrs Whatmore had applied for and been granted a rescission and was thus able to alienate and sell the land. The two products manufactured at the Mill (starch and conflour) both required copious quantities of water. Until 1890 water was supplied to parts of the North Shore from the Paddington Reservoir via Dawes and Milson Points. In 1892 an alternate supply became available. From Potts Hill Reservoir water was fed by gravity using caste-iron pipes to a new pumping station at Ryde. From there it was pumped through a wrought-iron pipe across the Lane Cove River to two service reservoirs at Chatsworth (sic)(Chatswood). The mill connected to this pipeline. In 1916 there were concerns about the quantity of water used by the mill – daily readings were taken. In 1897 the mill was almost destroyed by fire. The fire had broken out in the room where hot pipes dried the starch. At this time the four mill buildings were of brick and weatherboard with iron roofs. A replacement mill was built to plans by architect Geo. W Durrell. The new mill was constructed of wood (ironbark), oregon, hardwood and kauri with a galvanised iron roof. The river-front gable had barge boards of redwood. The original power for the mill was steam The exhaust steam was used to dry the cornflour and starch. Coal was used to feed the steam boiler using an elevator system. The cost of transporting coal to the mill was high. Coke was sourced from the North Shore Gas Company (later taken over by Australian Gaslight Company – AGL). Due to the cost of coal the owner of the mill (Clifton Love) was recommending conversion to oil. In 1949 the mill had to close because of a coal strike. One of the boilers was converted to oil. Oil was delivered up the Lane Cove River by a Shell lighter (small draft boat) from Shell at Greenwich. No record exists of the way the mill was originally lit. In 1912 the issue of electric lighting was discussed with Chatswood (sic) (Willoughby?) Council. However the outcome was that tenders were called for the mill to be lit by electricity from the company’s generator and batteries. As self-producing power became relatively expensive, in 1914 the company again approached Willoughby Council, without success. In 1919 the company contacted the city council (City of Sydney ?) about supply. But once again this appears to have resulted in DIY outcome. In 1929 additional electricity plant was installed – a Bellis and Morcom engine. This engine was donated to the Sydney Powerhouse Museum in 1994. It is on display and regularly operated at the museum. There are photographs in Johnson’s book showing Mill workers. Many of the people are identified by name. The telephone preceded the 1897 fire. It was used to call the fire brigade. In the early days the most common method of transport to the Mill was by boat. The first boat used was the Lighter “Nellie“, owned and operated by the Jenkins family of Millwood Farm, Little Blue Gum Creek. The Nellie was built in 1882 by Hilton Bros. and the Jenkins used it to transport fruit to the city. In 1911 Martha Jenkins sold the Nellie to Clifford Love. The Nellie was renamed Nellie Love in 1918. By 1926 only the hull of the Nellie Love was worth keeping she was stripped and used as a barge. The Annie Love, combination launch and lighter was built in Berry’s Bay in 1909. It was sold to Stannard Bros in 1938. The Peggy Love was built in McMahons Point in 1927. There was a plethora of trade marks, brand names and packing used for the products of the Mill. Used for some cornflour products. The trademark registered was for the whole packet. An example of this packet is at the Sydney Powerhouse Museum. The word ‘Laundrena’ was the trademark. Laundrena was associated with a starch product. Appears to have been registered as a trademark for an export cornflour product. Milkricha was a gluten meal mixture sold to the dairy industry. 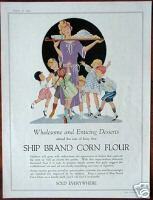 Clement’s cornflour was sold in Queensland, Wade’s in New South Wales and Brown & Polson’s in Victoria. A bath starch of coloured and scented starch crystals. A one-pack adhesive used in the corrugated board industry. In August 1916 the Australian Manufacturer argued that a housewife no longer needed to buy in bulk from her grocer. The intelligent, economic housewife could now buy what she needed in cartons, tins or bottles. Packing starch was a hard, tiring job, all done by hand. For rice starch (such as Clifton’s Lilywhite Starch), the process consisted of steeping (to pass slowly through small openings or pores) the rice in a caustic soda solution, putting through a buhr mill (a grinding machine utilising a fixed and mobile surface through which materials pass). The resulting slurry went to a vat where the starch settled and the liquid containing the protein was siphoned off. For maize starch and associated products the process consisted of separating the parts of the kernel (germ, fibre, gluten and starch. Each was then processed for a specific use. After seeping, the maize was put through buhr stones to tear, rather than grind, the softened kernels. Then the pulp went to the germ separator. Because the germ is lighter than the grain, separation was by gravity. The germ was removed by skimmers. The solids sank and were passed through a series of shakers. What was left after the shakers was the starch and gluten slurry. Starch was put in the settling vat and water added. The starch would settle and any gluten remaining would float. The gluten would be removed by suction pump and dried. Starch intended for domestic or laundry use was moved to separate vats where water and caustic soda (and ‘blue’) was added. The starch settled and was moved into a starch press and water was vacuumed from it. The starch was wrapped in paper, tied with string and dried. The drying process caused a crust to form on the starch. This was removed by hand using a large knife. The starch was then packed. All residue from the various processes was pumped to the feed house to be processed into cattle food. In 1894 most of the rice in the colony was imported (from China or India). By 1934 rice was being sourced from Leeton. Maize (corn) during the early years of production seems to have been sourced from around Grafton on the north coast of NSW. In 1915 maize was purchased from South Africa. In 1918 the Macleay River was mentioned as a source.. In 1883 Willoughby Council had decided to clear and stump Mowbray Rd West from the Lane Cove Rd (now Pacific Highway) to the river. Unfortunately, work stopped about 2/3 of the way along the road. By 1920 there was a clear need for a formed road to the Mill and the tender was let and the road constructed. In 1938 the Epping – St Leonards Main Road (Epping Rd) was being constructed and routed across Mill land. This interfered with the Mill access road. It wasn’t until 1944 that a new access road was completed. The construction of the road meant that grain could be transported to Lane Cove by semi-trailer (or by train to St Leonards) then by truck to the Mill. 2010: Corn Products International changed name to Ingredion. Title: Goodman Fielder (GMF) /​ Bill Pridham. Other Authors: Warburg Dillon Read Australia Equities. Published: Melbourne : Warburg Dillon Read, c1999. Food industry and trade — Australia. Boiling down is the process of rendering fat from animal carcasses to producetallow. It was a common small-farm activity for making soap and candles for domestic use, but was industrialised in the early 19th century, particulalry in Australia. Mr. Tarleton, instructed by Mr. J.A. Cahill, appeared for the plaintiff. The defendant did not appear. This was an action brought by Eliza Monroe, widow, who at one time carried on business as a dressmaker, against John Sugden Berry, widower, to recover £500 damages for breach of promise of marriage.